If you have never seen a muskellunge (Esox masquinongy), they are magnificent, large, and powerful apex predators in the waterbodies they reside (Figure 1). Georgian Bay in Lake Huron supports a self-sustaining native muskellunge population; however, there are concerns the population may begin to decline due to habitat degradation. Efforts to conserve muskellunge (and other fish) populations generally consist of size and possession limits, and encouraging catch-and-release fishing. However, these efforts may not be enough as muskellunge may be more threatened by the degradation of their nearshore spawning and nursery habitats. In fact, a survey of a traditional nursery site in the Severn Sound region of Georgian Bay failed to find any young muskellunge born that year (Leblanc et al. 2014). Figure 1. A muskellunge swimming in its freshwater habitat. Source: Wikimedia Commons. To understand how habitat degradation may be negatively affecting the Georgian Bay muskellunge population, a team of researchers from McMaster University monitored the spawning habitat use of adult muskellunge over multiple years in Georgian Bay (Weller et al 2016). In particular, they were interested in investigating whether muskellunge exhibit “spawning site fidelity”, the use of the same spawning and nursery sites year after year. 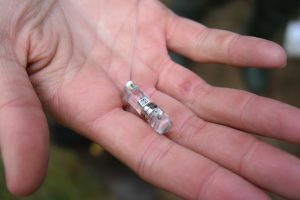 To achieve this, researchers caught adult muskellunge between 2012 and 2014 and implanted radio tags into their abdomens (Figure 2). 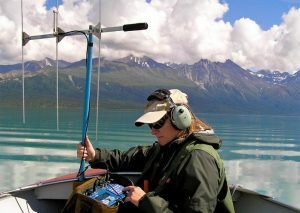 These radio tags emit a unique signal that can then be detected and tracked with a radio antenna and receiver from a boat (Figure 3). The researchers went out multiple times each year during the spawning season to track the locations of tagged muskellunge. Each time they came across a signal, they recorded the radio identification number and the approximate GPS coordinates where the signal was received. Figure 3. A radio antenna used to receive signals from implanted radio tags once within range. Photo Credit: NPS. Seventeen fish were tracked for multiple seasons, each having their location recorded at least five times. It appears that muskellunge have a strong preference for using the same nearshore spawning habitats annually. Sixteen of the seventeen fish went back to the same spawning grounds they visited in prior years. This lends strong evidence to the idea that muskellunge do indeed exhibit site fidelity. The effect appears to be stronger in male muskellunge as they arrive to the spawning grounds before the females to set the stage for spawning. It is unclear if spawning ground preference lasts the entire lifetime of a muskellunge, or if males would change their spawning ground preference if severe degradation were to occur. Muskellunge are a popular species for recreational fishing, but they are also invaluable to the ecosystems they inhabit. As an apex predator, they keep the abundance of prey species in check. The results of this study indicate the extreme importance of maintaining the health of spawning habitats and nurseries for our native fish species. We may enjoy the shores of our waterbodies, but we have to be mindful that some species rely on these habitats to survive. 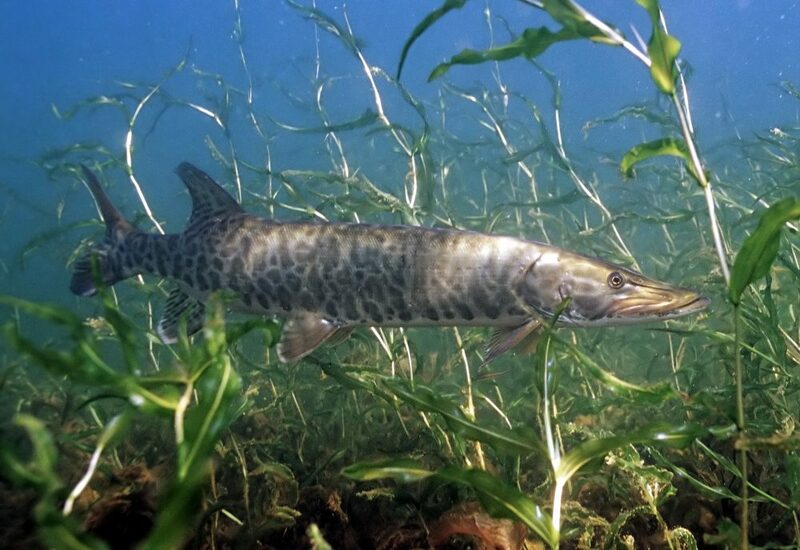 Policy aimed at protecting important nearshore habitats would ensure species like the muskellunge will still be around for future generations to enjoy. Leblanc, J. P., J. D. Weller, & P. Chow-Fraser. (2014). Thirty-year update: Changes in biological characteristics of degraded muskellunge nursery habitat in southern Georgian Bay, Lake Huron, Canada. Journal of Great Lakes Research, 40(4), 870 – 878. Weller, J. D., J. P. Leblanc, A. Liskauskas & P. Chow-Fraser. (2016). Spawning season distribution in subpopulations of muskellunge in Georgian Bay, Lake Huron. Transactions of the American Fisheries Society, 145(4), 795 – 809.